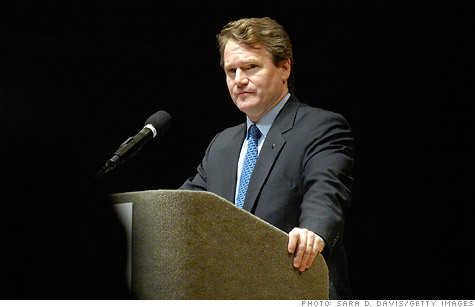 Bank of America's CEO defends $5 fee. WASHINGTON (CNNMoney) -- Bank of America's CEO defended his bank's new $5 fee on debit cards on Wednesday, saying that customers and shareholders understand the bank has a "right to make a profit." Bank of America (BAC, Fortune 500) CEO Brian Moynihan defended the move, which the bank announced last week in response to new caps on debit card swipe fees that the banks charge retailers. Bank of America's announcement of a new debit card fee was followed today by an announcement of new checking account fees by Citibank (C, Fortune 500). These new bank fees have fueled a populist backlash that has coincided with a series of protests against Wall Street banks around the nation. Moynihan stopped short of criticizing President Obama who earlier this week said to ABC that banks don't have an "inherent right" to a "certain amount of profit." But BofA's chief did say banks have an inherent right to make a profit in an interview Wednesday with CNBC's Larry Kudlow at the Washington Ideas Forum, sponsored by the Newseum, the Aspen Institute and the Atlantic magazine. "I have an inherent duty as a CEO of a publicly owned company to get a return for my shareholders," Moynihan said. Moynihan said that the bank will talk to its customers, teammates and shareholders and "they'll understand what we're doing -- understand we have a right to make a profit." Moynihan said the bank had made the fee clear and transparent to its customers and noted the bank had given plenty of advance notice because the fee won't kick in until next year. But he said the new charge was necessary because the "ability to be profitable" in retail banking has changed. He added that Wall Street reforms in the so-called Dodd-Frank Act will cost his bank "billions." When Kudlow asked Moynihan if he felt the bank was under attack, Moynihan said "no." "We have the best bank in the world, we do a great job for our customers," he added. Later, Moynihan was asked about an entirely different issue, whether he supported a proposed tax on millionaires that Senate Democrats proposed today. He said he'd echo what he hears from his millionaire customers: "Yes, but what for?" "If the belief is that it puts our fiscal house in order, then they support that," Moynihan said.